Hanoi (VNA) – Vietnam and the United Arab Emirates (UAE) possess potential for long-term and supplementary cooperation for mutual development, Party General Secretary and State President Nguyen Phu Trong has said. He affirmed that with efforts exerted by both sides, the friendship and economic, trade and investment cooperation between the two countries will develop more dynamically and efficiently while hosting Minister of Energy and Industry of the UAE Suhail Mohamed Faraj Al Mazrouei in Hanoi on March 28. The minister, who is on a working visit to Vietnam on March 27-28, handed over a letter from UAE President Sheikh Khalifa bin Zayed Al Nahyan inviting Party General Secretary and State President Nguyen Phu Trong to pay an official visit to the UAE and attend the 24th World Energy Congress scheduled for September 2019 in Abu Dhabi. He briefed his host on the results of his talks with the Minister of Trade and expressed his wish to step up the economic cooperation between the two countries, particularly in energy. The Vietnamese leader hailed the minister’s visit, expressing his belief that it would help further the multi-dimensional cooperation between the two countries, especially in energy and industry. He congratulated the UAE on its immense socio-economic attainments and asserted that Vietnam attaches importance to the sound friendship and multi-faceted cooperation with the UAE, one of Vietnam’s leading trade, investment and labour partners in the Middle East. He said he is delighted with the robust development of the bilateral ties over past time, delivering his wish to soon welcome President Sheikh Khalifa bin Zayed Al Nahyan to visit Vietnam and suggesting the two sides continue to exchange visits at all levels. He suggested the two countries share information, establish channels to promptly provide information for the business circles, and encourage businesspeople to participate in trade fairs, expos, seminars, and business forums held in the respective countries, thus working towards a two-way trade value of 10 billion USD before 2020. 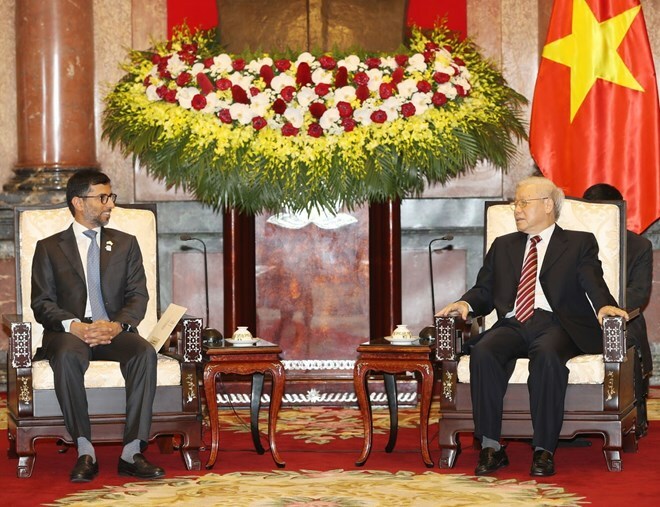 He said the two countries have potential to increase their affiliation and investments in new and renewable energy, oil and gas, and infrastructure, and should encourage and facilitate their businesses’ plans to carry out investment projects, market research, oil and gas production, and renewable energy development, suggesting the UAE share experience in energy security with Vietnam. He pointed that the two countries would study to expand their cooperation to other fields of potential based on the win-win principle, like finance service, shipbuilding and repair, garment and textile, footwear, food processing, and agriculture.